Kinect for Xbox 360 brings the newest development for family gaming systems. You don’t need a controller or anything attached to you. Just position yourself in front of the television, and the Kinect sensor tracks your movements and responds. So what can you do with this game system? 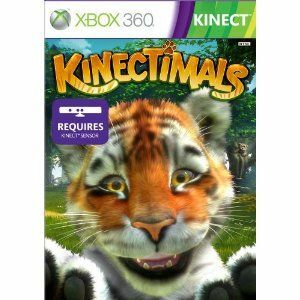 One new game for Kinect is called Kinectimals. This adorable game is rated E for Everyone. It is great for children and families, allowing the player to have their very own pet jungle cat and explore mysterious island landscapes with their new cub friends. In Kinectimals, there are five young jungle cubs to play with. These include lion, royal Bengal tiger, cheetah, leopard, and black panther. Six more cubs are revealed later in the game. These lovable, furry creatures can learn to play with you, do tricks, complete obstacle courses, and uncover mysteries of the island with you. They follow your movements, copying you as you jump and play dead. Let your cub look for you as you hide in your living room. Watch your friend smile while you pet him and scratch his ears. As you spend more time with your jungle friend, he will grow more attached to you, forming a loving bond. You can uncover even more furry friends to play with by purchasing a Kinectimals limited edition plush doll. Once purchased, these plush animals can be scanned by your Kinect sensor and come to life in the game. Your feline friend can stay with you at home or be carried around with you in your very own arms. Not only are there several friends to be found in Kinectimals, but there are also seven landscapes to play in and explore. In the game, you find yourself on the island of Lemura. Journey to different parts of the island where you can run through jungle glades, play on sandy beaches, search through a mysterious temple, and even discover a city frozen in ice. The island’s shy caretaker will invite you to help him learn about the Legend of Felis Aurum. There are many gorgeous places to see and secrets to uncover in this fun adventure. This exciting new game for Xbox Kinect is a great game for all ages. It’s a wonderful way to play around with your very own wild pet without any of the danger or mess. Buy it online or in stores from any of Xbox’s many retailers. It is sure to provide hours of fun playtime and laughter in your home. About the Guest Blogger: Louise Baker blogs about getting an online degree at Zen College Life. Her most recent post looked at the best online schools.